HBO has announced that with the return of Westworld later this year, they’re bringing the experience of the show to SXSW and will construct an entire town from the ground up for an immersive experience exclusively for South by Southwest Conference and Festivals badge holders. 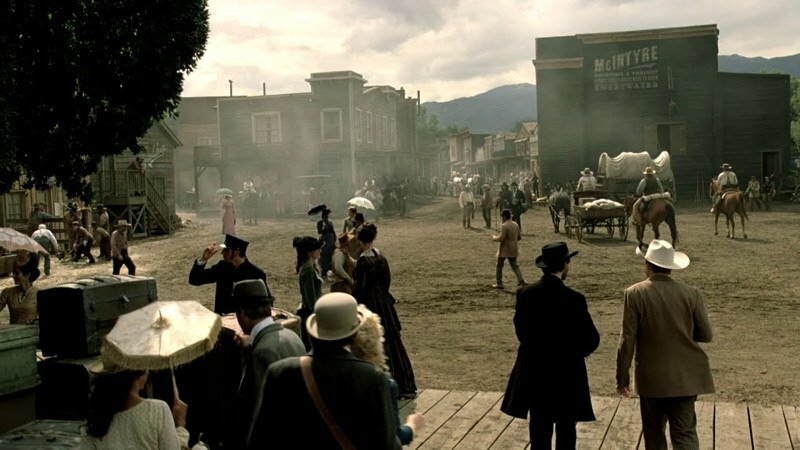 Open for three days only – Friday, March 9, through Sunday, March 11 – the Westworld-themed park will feature reproduced versions of iconic locations and elements from the hit HBO series, including the luxury hotel The Coronado and the Mariposa Saloon. You can sign up for the event yourself by clicking here. Previous activations at San Diego Comic-Con and New York Comic Con gave fans an opportunity to experience the unsettling interview and check-in process at Westworld. This new experience will take them even deeper into the storyworld of the show, allowing them to explore more than two acres of custom-built parkland. After registering for an appointment at DiscoverWestworld.com, guests will head to downtown Austin’s EastSide Tavern to check in. A luxurious Delos Shuttle will then drive them to a location just outside Austin, where they will visit a fully immersive, functional version of Sweetwater, the town at the center of the Westworld theme park from the series. Upon arrival, guests will be assigned a black hat or white hat and set loose to explore the park. No guidebook. No orientation. Guests will get to live without limits as they interact with dozens of hosts across a variety of narratives, while hunting for clues about what’s to come in season two. Some of these clues will be hidden around the park, while others can only be discovered by asking the right questions of specific hosts. They will also have the opportunity to sample western-themed food and cocktails and to uncover other personalized elements that will make each visitor’s experience unique. Once their time in the park has ended, the Delos Shuttle will return guests to EastSide Tavern. The entire experience will last approximately two hours. SXSW attendees who want to visit Westworld can register for an appointment by visiting DiscoverWestworld.com starting today. Half of the available slots will be booked in advance, with the remaining appointments opening up during SXSW for those who missed early registration. Attendees must be 21 years of age or older, with valid ID. For guests who aren’t able to secure a reservation, an exclusive partnership with Lyft will allow fans with access to a secret code to unlock a custom Westworld-themed Lyft experience. Lucky fans who catch a ride in this mode will be treated to a free ride to the park and uncover in-story surprises along the way. A select group of people heading to SXSW will also have the opportunity to start their Westworld experience even earlier. Delta Air Lines and HBO will bring them to a place where fantasy and technology meet at 30,000 feet on an immersive Westworld-inspired flight. Guests will arrive at LAX for their flight bound for Westworld, interacting with Delos hosts and Sweetwater locals. Once onboard, guests will be treated to Westworld-themed cocktails, don a white or black hat, and receive a personalized invitation to the Live Without Limits Weekend experience in Austin. This invitation-only flight departs Los Angeles for Austin on Friday, March 9. Westworld fans at SXSW can also get the scoop on season two directly from the show’s creative talent. Series co-creators Jonathan Nolan and Lisa Joy will join cast members Evan Rachel Wood, Thandie Newton, Jeffrey Wright and James Marsden for a Featured Session on Saturday, March 10, 3:30-4:30 p.m. in the Austin Convention Center, Room D.
Debuting in 2016 to become HBO’s most-watched freshman series ever, Westworld is a dark odyssey about the dawn of artificial consciousness and the evolution of sin. The season one cast included Anthony Hopkins, Evan Rachel Wood, Thandie Newton, Ed Harris, Jeffrey Wright, James Marsden, Tessa Thompson, Sidse Babett Knudsen, Jimmi Simpson, Rodrigo Santoro, Shannon Woodward, Ingrid Bolsø Berdal, Ben Barnes, Simon Quarterman, Angela Sarafyan, Luke Hemsworth, Clifton Collins, Jr., Talulah Riley and Louis Herthum. Joining the season two cast are series regulars Katja Herbers, Gustaf Skarsgard and Fares Fares.